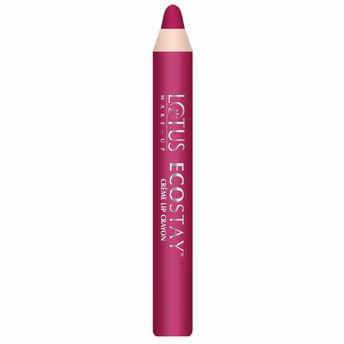 Indulge in the passion of rich silky matte texture with the new Lotus Ecostay Creme Lip Crayons. These lip crayons offer long-lasting color pay-off, glide on smoothly and give intense color in just one stroke. Enriched with Shea Butter, which acts as a natural moisturizer these lip crayons heal dry and chapped lips, and keep them nourished whole day long. Enriched with Shea butter - It acts as a natural moisturizer that helps in healing dry and chapped lips, keeping them nourished whole day long. Explore the entire range of Lip Crayon available on Nykaa. Shop more Lotus Herbals products here.You can browse through the complete world of Lotus Herbals Lip Crayon .Alternatively, you can also find many more products from the Lotus Make-Up Ecostay Creme Lip Crayon range.